Outdoor advertising, also known as out-of-home advertising, is any form of advertising that primarily reaches the audience while they are outside of the home, and often relies on the fact that the audience is in transit to another place. Almost every demographic (gender, age, marital status, education, income level, etc) leaves the house at least once per day, and outdoor advertising relies on this regularity to bring their message to the right demographic at the right point in time. As reported by Arbitron in their 2013 Out-of-Home Advertising Study, the average time spent in transit is over 20 hours per week – that’s almost three hours per day that people are reachable by various forms of outdoor advertising. 72% of outdoor advertising viewers say they “frequently” or “sometimes” shop on their way home from work. 68% say they “frequently” or “sometimes” make their shopping decisions while in the car. 38% make the decision to stop at a business or store while on their way home. 24% say they were motivated to visit a particular business that day because of an outdoor ad they saw. 32% say they visited a retailer within a week of seeing an outdoor advertisement. Although building signage is not the first thing that may come to your mind when we talk about outdoor advertising, it is one of the most influential and important types of outdoor marketing available to your business. Building signage is what gives your location, presence, and placement to someone as they are driving by or as they are trying to find you. Your signage should be big, bright and clear to street viewers, day or night, coming from either direction. Other building signage to consider are parking signs, entrance or exit signs, your office hours on the door, or any special directional placards noting how to reach your main entrance. 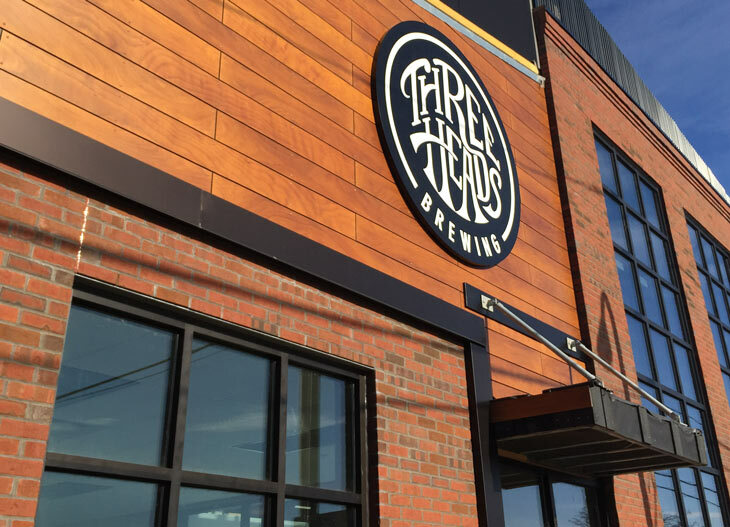 Three Heads Brewing building signage completed in March 2016. Corporate vehicles can be large mobile advertisements used to keep your business top of mind. The best types of vehicles to advertise on are vans or work trucks, but any vehicle with space on the doors or back windshield can work. When designing for a vehicle wrap or vinyl, it’s important to remember that your vehicle will most often be viewed while moving, so keep your messaging and contact information large, clear and uncomplicated. Other drivers won’t have much time to make heads or tails of your graphics, so make it as easy to read as possible. 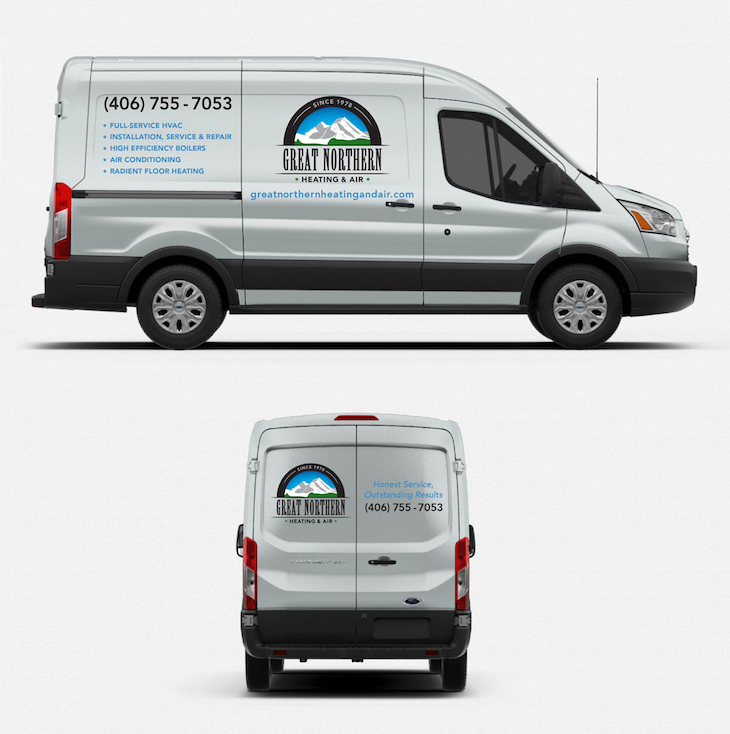 Great Northern Heating & Air vehicle vinyl mockups. Billboards are the most classic, and most historic, form of outdoor advertising available. According to the Outdoor Advertising Association of America, the first billboards were large format circus posters used in 1835 (followed soon after in 1850 by posting advertisements on street railways). Billboards in a given area are typically owned by one company and are then rented on short term contracts, about two to three months at a time. The cost of a contract varies widely depending on the quantity of billboards, rental length, and the location of the billboards themselves. A good rule of thumb is to estimate about $1,500 per month per billboard in a medium-sized marketplace. Due to their higher cost, billboards should be used as one part of a larger marketing campaign in order to see the most return. 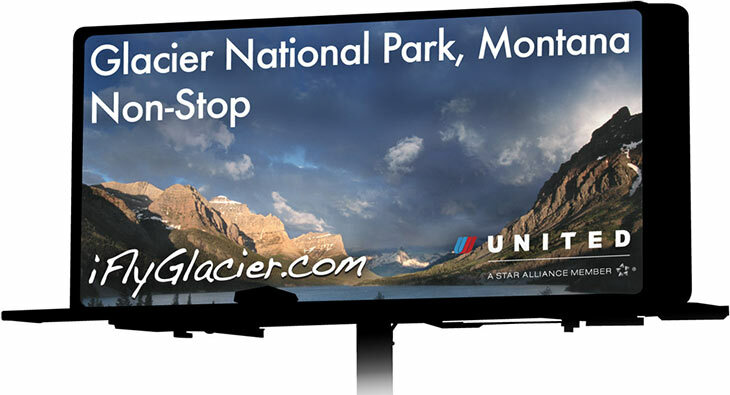 A billboard for Glacier Park International Airport, in Kalispell, MT. There are a lot of things to keep in mind when you are incorporating outdoor advertising in to your marketing plan, from a logistics, design, and regulations standpoint. Where will your advertisement be? 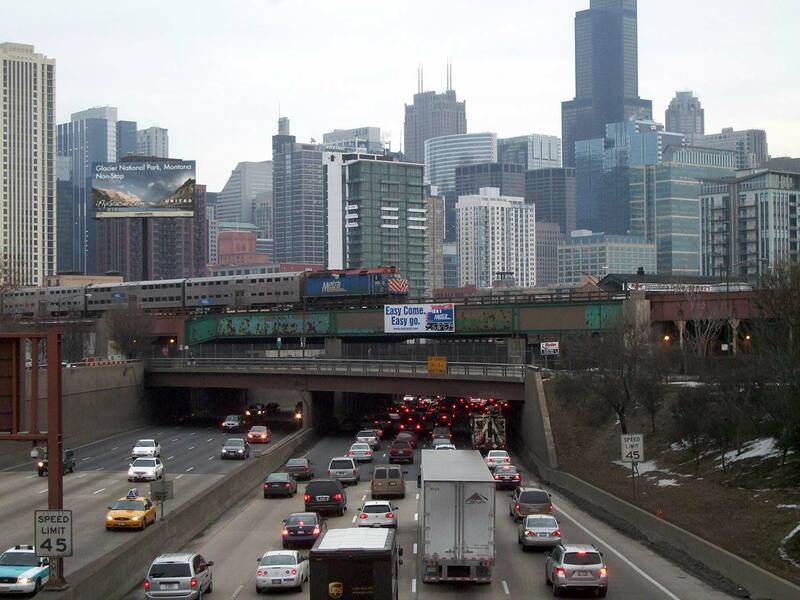 You shouldn’t choose an advertising location purely based on the amount of traffic it sees. Consider if the traffic is made up of your target demographic – it’s better to have less quantity but more targeted traffic than the opposite. 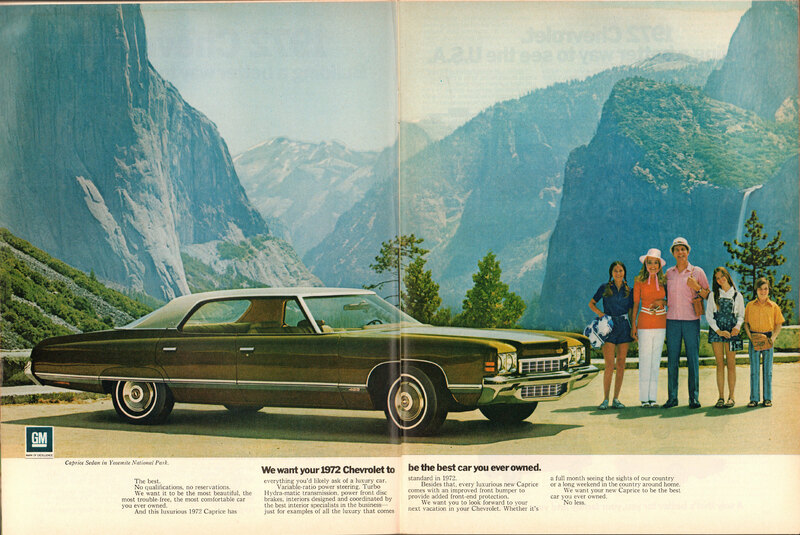 Is your advertisement easily seen from multiple directions? When will your campaign launch? This should align not only with your internal business and marketing timelines, but also with when the traffic around your outdoor advertisement will be the most relevant for your demographic. For example, you wouldn’t want to advertise your new line of bathing suits on a billboard in December. What material will your advertisement be made of? Plastic, paper, vinyl, metal – different advertising needs require different materials and different mounting considerations. Building signage needs to be constructed of durable, weather and UV resistant material, while your billboard may be vinyl or even digital. What are your lighting requirements? Will people be able to see your signage at dusk or into the evening? Does the advertising space have built in back lighting? Will the lighting affect the legibility of your ad? Who is managing the design and printing of the advertisement itself? Some outdoor advertising agencies require you to use their third-party printer, but what are the costs? Will they manage the mounting of the advertising, or are you expected to find a third-party provider? Is your messaging correct for the location? Are you using language and content that relates not only to your target demographic, but also to the demographics that will see your advertisement based on its location? You wouldn’t want to advertise your restaurant’s new happy hour specials in a bus stop that mostly services students during the school year. Is your content understandable, even at a quick glance? Most people in transit have only a short amount of time to spend reading and comprehending your advertisement. If your message requires a lot of explanation, outdoor advertising may not be the best media. What is your call to action? Are you asking people to remember a lengthy URL, or a difficult phone number? Will people be able to find you by doing a Google search for the messaging used in your ad, or will they be directed to a competitor? Are there any local codes that govern the color of your signage? Many plazas and business centers require businesses to have building signage of a single, specific color. Are there any size regulations? There are often city or county based ordinances that relate to the maximum size that your advertisement can take. Are there any state-wide bans on your particular type of outdoor advertising? Vermont, Hawaii, Maine and Alaska all prohibit billboards of any type. Can your advertisement be considered a billboard based on their definitions? What are the permits and/or approvals that you need to obtain? Many outdoor advertisements require you to obtain proper permits and approvals before being posted. What channels do you need to go through in order to apply? What are the timelines involved? How long are the permits good for? Do you have to re-apply at regular intervals? Outdoor advertising of any type can be difficult to plan and execute properly, whether that’s due to the cost, the size, the contract commitments, the design or the regulations. However, it can be an extremely effective type of marketing when used as one part of your overall marketing plan. If you’re considering how outdoor advertising could perform for your business, reach out to us. Our previous outdoor advertising experience can help you get the most out of your efforts!